Within the frame work of rural economic development component the CBA project continues to support the development of agricultural services cooperatives. In addition to 23 coops supported in 2015, the CBA project has already approved 9 cooperative micro projects. 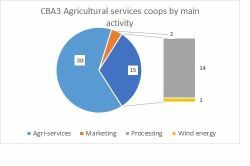 Cooperative development within the CBA provides real sustainability for rural communities, providing tools for coop members for tillage, cultivation, milk and fruits processing, fuel briquettes new marketing possibilities depending from ASC specialization (see Diagram). People really need it and enjoy participation in the program because it is the only way to obtain new machinery and equipment in the current difficult circumstances. In April – May we are expecting finalization and delivery of further cooperative micro-projects. It means that more people will obtain support from the EU for development of their small business initiatives in villages. Besides, people certainly hope for continuation of the CBA project in the coming years as the most successful and fruitful EU/UNDP initiative in Ukraine. Pictures below show the process of transferring new agricultural equipment to coops in Sumy region (one of 12 regions where agricultural coops are supported by the CBA).